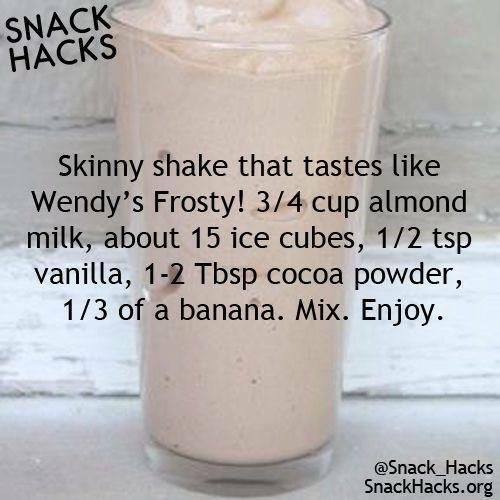 SNACK HACKS SKINNY SHAKE THAT TASTES LIKE WENDYS FROSTY! 3 - ProudMummy.com the Web's Community for Mums. SNACK HACKS SKINNY SHAKE THAT TASTES LIKE WENDY'S FROSTY! 3/4 CUP ALMOND MILK, ABOUT 15 ICE CUBES, 1/2 TSP VANILLA, 1-2 TBSP COCOA POWDER, 1/3 OF A BANANA. MIX. ENJOY.